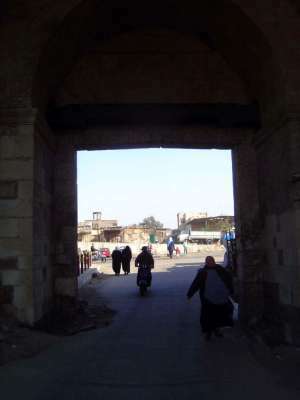 We're going to walk north-to-south through and then beyond the historic core of Cairo, the city founded in 966 as al-Qahira, "The Victorious." In other words, there's next to nothing in this or the two following chapters about either the pharaonic or modern periods. There are, on the other hand, about 900 years of urban history here, stretching from the Fatimids through the Ayyubids and Mamelukes to the Ottomans. 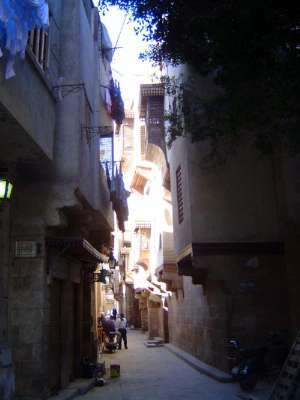 Throughout, Cairo remained very compact, so our walk is only about two miles. And that's the long way through the city: east-to-west, the distance is about half a mile. You should also know that we'll follow the city's main road. 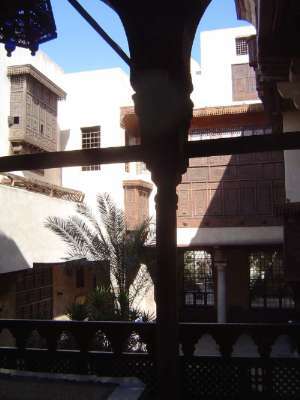 It's the axial qasaba, literally the windpipe and by corruption the English "casbah." This way, we can't get lost, even if after all these years parts of the road are still unpaved. Unless indicated otherwise, the captions in this and the following two chapters are based mostly on Nicholas Warner's meticulous though hard-to-use The Monuments of Historic Cairo, 2005. 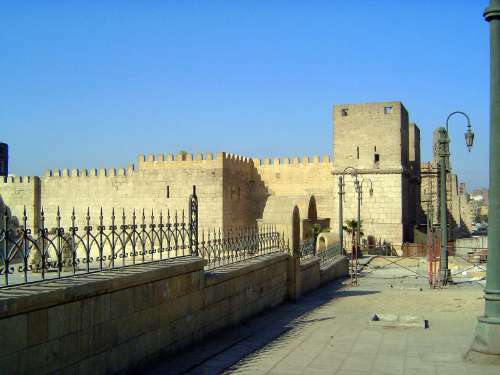 We're at the north end of the city and looking at its wall and two gates, the nearer Bab al-Nasr ("The Gate of Victory") and, barely visible at the far right, the Bab al-Futuh ("The Gate of Conquests"). 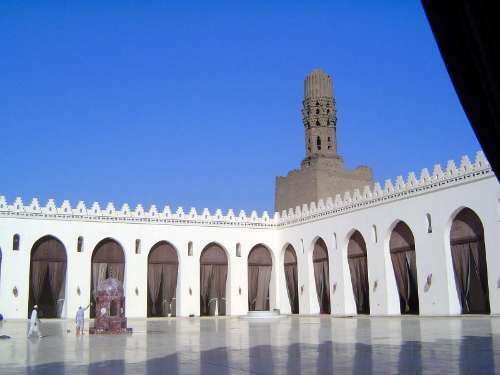 All were built by a vizier, Badr al-Gamali, in 1087, about a century after the original city of al-Qahira was established by Gawhar al-Siqilli. That earlier city was a near square whose boundary on the north was enlarged by these later additions. It's easy to dismiss a wall as just a stack of stone, but K.A.C. 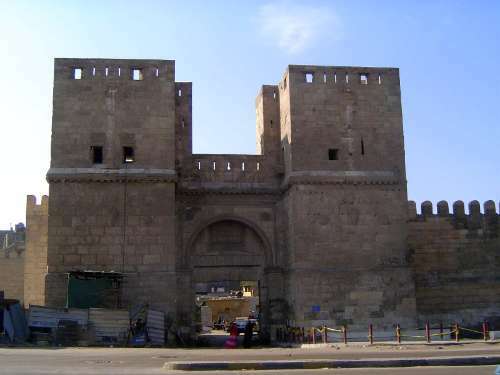 Creswell, in his monumental The Muslim Architecture of Egypt (1952) writes that these two gates, along with the surviving southern gate (the Bab Zuwayla, shown in the next chapter), "form one of the greatest masterpieces in the military architecture of Islam.... 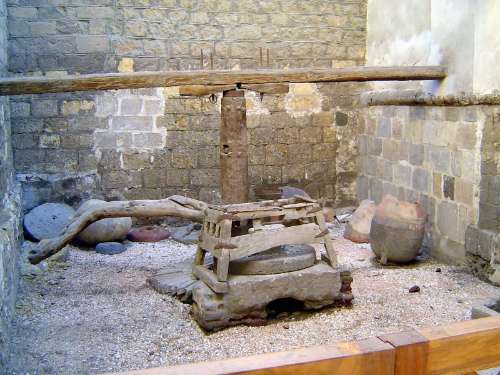 The masonry of the whole group is of a degree of perfection never again attained in Egypt" (vol. 1, p. 165). Immediately to the north is this slum. It used to wash right up to the city's wall, which after all provided excellent structural support, but Napoleon ordered the wall cleared in 1800. By 1943, according to Creswell, the view of the wall was again blocked, this time with "bakeries, a soap factory, shops, and hovels." At his instigation, the government once again pushed the slum back. And so we now have an historically misleading but comparatively tidy view of the Bab al-Nasr. Note: If you're taking notes, you should know that since about 1900 several hundred of Cairo's monuments have been officially numbered. This gate, for example, is No. 7. In this and the following two chapters, monument numbers are indicated at the top of the captions. 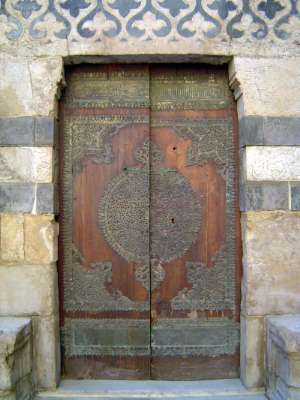 The Fatimids were Shia Muslims, and over the Bab al-Nasir is the Shi'a version of the shehada, or profession of faith. It adds to the Sunni version the statement that Ali is the friend of Allah, the successor to the messenger of Allah (Muhammad), and his first caliph. (No. 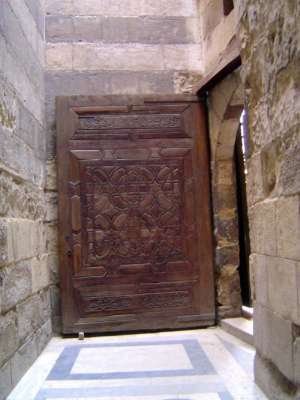 6) The Bab al-Futah, "The Gate of Conquests," has round flanking towers instead of square ones. It's also the main entrance to the axial road or windpipe or qasaba, which, to make matters confusing, has several specific names along its course. We won't worry about them; in a moment or two we'll head in and just follow the road with a few minor detours. 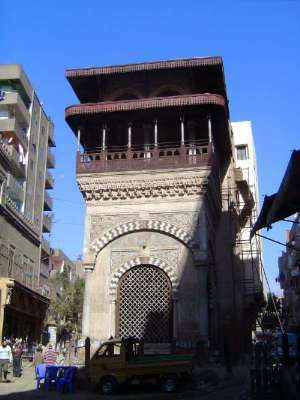 One of the flanking towers of the Bab al-Futah. (No. 352) Before we go through the gate, whose curves you can see on the right, let's back up for a moment. The wall is the wall of 1087, made of stone-faced rubble. 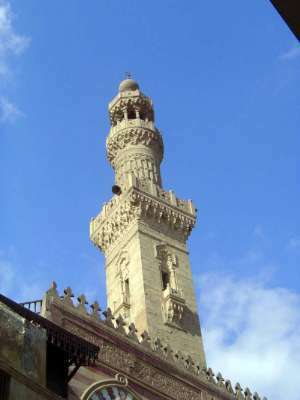 Behind it, the massive square tower with a minaret is part of the Mosque of al-Hakim, which was outside the city as originally walled. The view from inside the gate and looking out. (No. 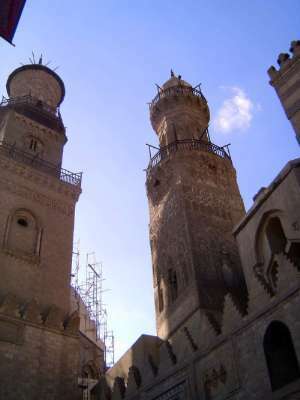 15) Same tower and minaret, seen now from inside. 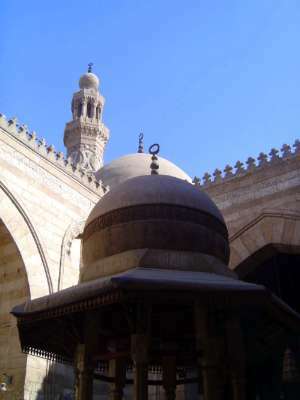 Built between 990 and 1013 in the courtyard style of the earlier Mosque of Ahmad ibn Tulun, which is at the southern end of the city (and which is shown at the end of the next chapter), the Mosque of al-Hakim was damaged in an earthquake in 1302. 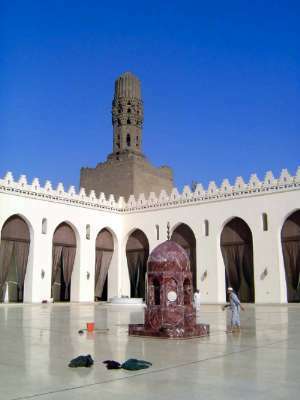 The mabkhara or finial of the minaret was added after that, but the mosque was subsequently abandoned and used variously as a prison, fortress, storehouse, stable, and museum. 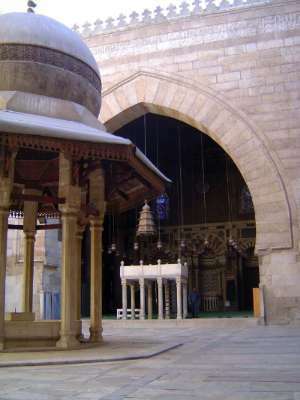 Its condition today is the result of recent repairs by Bohra Isma'ilis, who rebuilt all the arcades shown here, repaved the courtyard or sahn, and replaced the ablutions fountain, getting a wash here. 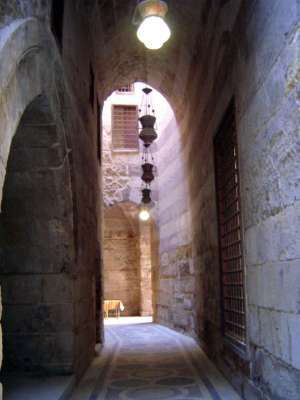 We've stepped from the bright courtyard into the arcade facing the comparatively simple, almost institutionally sterile qibla wall. 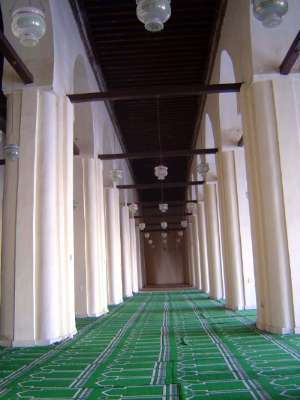 We're turned 90 degrees, to get a sense of the scale of this mosque; there's a similar view if we now turn 180. It's more colorful outside, with construction equipment and sacks of onions. We're looking north. Not what you expect? 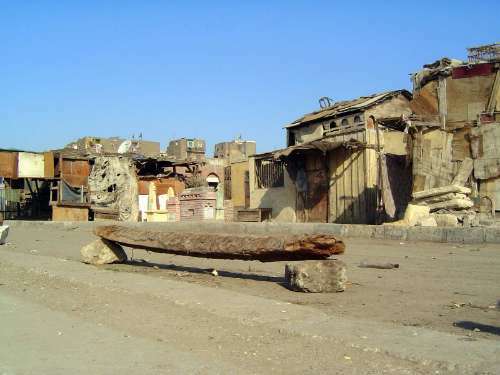 But Cairo in large part is a collection of villages whose maintenance is ignored, at least in comparison to the attention paid to its monuments and more prosperous neighborhoods. We're looking south now. 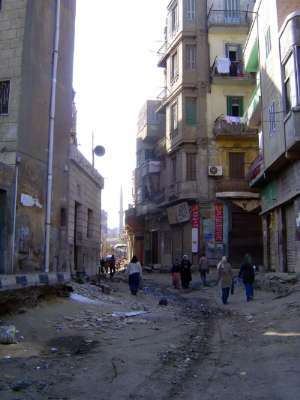 Despite the condition of the road, there's obviously been a lot of private money put into new buildings in the old city. The juxtapositions are sometimes striking. (No. 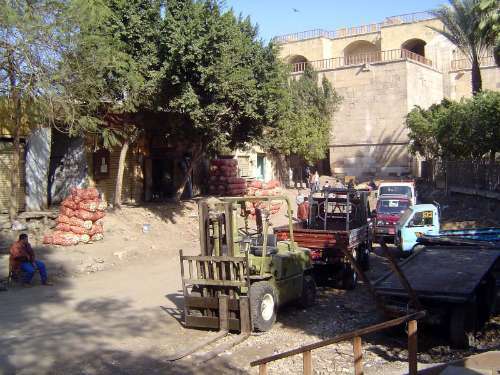 591) We've taken an alley and come a block to the east to find the partially restored Sabil and Wikala-- that would be water source and merchant hostel--of Udah Basha. 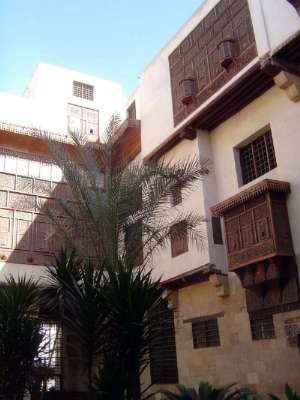 It was built in 1084 for fabric merchants from the Fayyum, west of the city. (No. 32) Just to its south is the Khanqa, or sufi monastery, and Mausoleum of Baybars al-Gashankir, "the taster," built between 1306 and 1310. 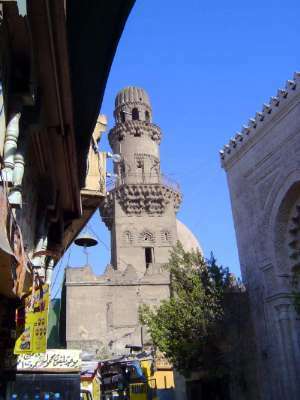 Cairo's famous medieval annalist, al-Maqrizi, calls it "the most magnificent monument of Cairo, the largest and the most solidly constructed; the proof of the quality of the construction of his khanqa is that it has never needed repair, from its foundation to this day" (Creswell, vol. 2, p. 249). Baybars might have wished a comparably long life for himself, but he was sultan only from 909 to 910, when he abdicated, fled, and was captured and strangled. His name was removed from the tomb's inscription band. Entrance. 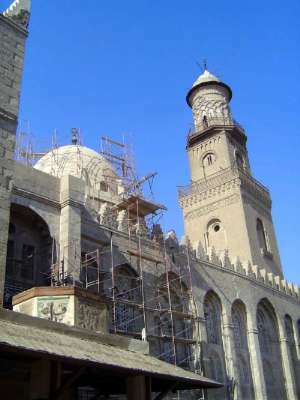 Unfortunately, like so many of Cairo's monuments, this one was closed for renovation in early 2007. (No. 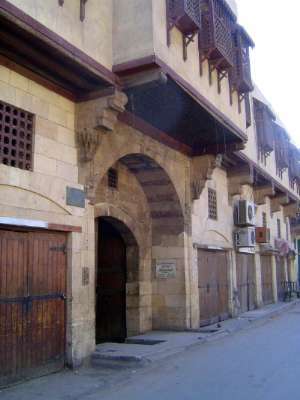 339) We're heading back to the main road, but we'll stop here at Bayt al-Sihaymi, built in the 17th century as the house of Shaykh al-Tablawibut. 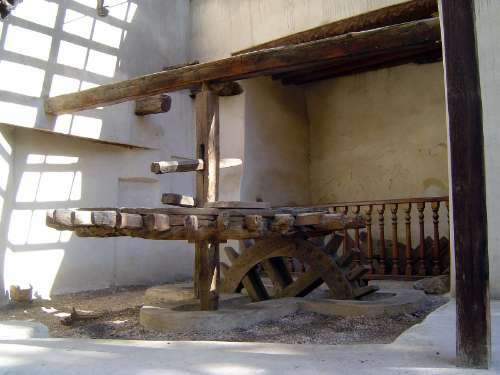 Now a museum, the whole house was restored first in the 1930s and again in the 1990s. Surprised? It's big, with many elaborate rooms around this large courtyard. 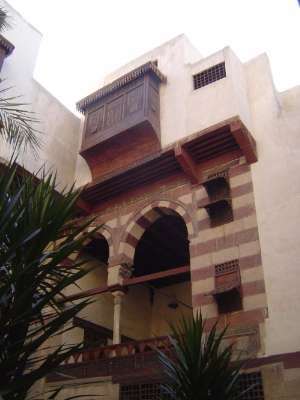 Here's a maq'ad, a loggia facing the courtyard. The view from that loggia; note the ancient column used to support the room opposite. 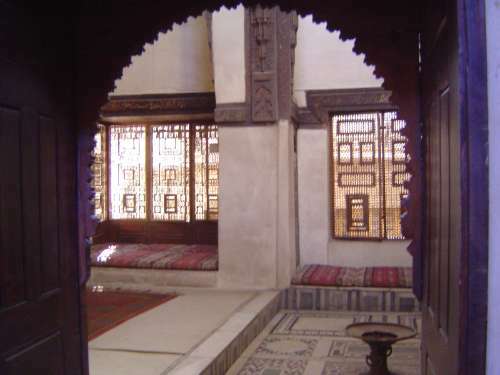 A qa'a, or reception room. 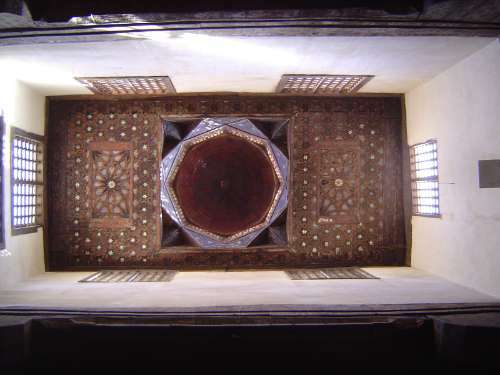 A (very) raised ceiling, with dome. 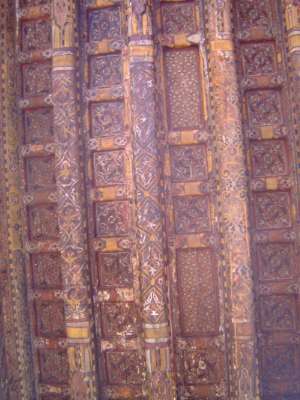 Elaborate mashrabiya, a wood screen that gives privacy and reduces the painfully bright light. The neighbors get a good view. (No. 382). 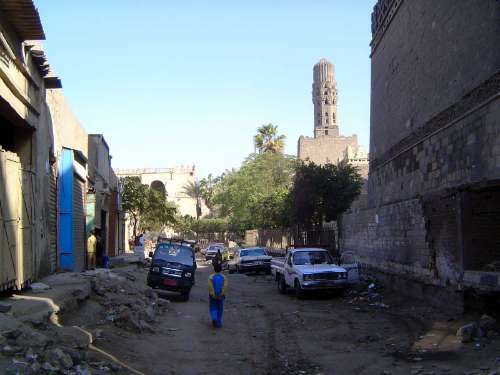 We're back on the main street now and looking north to the Sabil (water source) and Mosque of Sulayman Agha al-Silahdar. 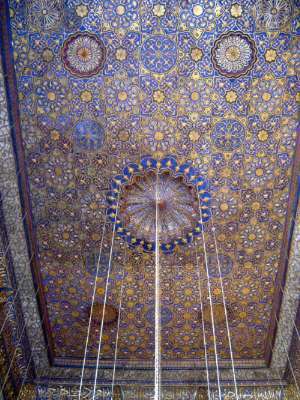 It's an Ottoman building with a distinctively Ottoman design, built in 1837 by a minister of Muhammad 'Ali. 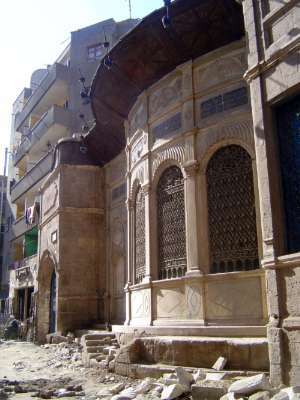 The facade of the sabil. Bronze grill with the words Masha Allah, "God has willed it." 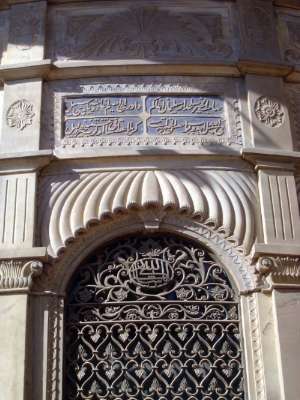 The inscription at the upper right says that the fountain was given for the sake of Allah by Sulayman Agha al-Silahdar. Behind that grill, there's a deep but now-dry reservoir. Time to continue south along the main street. 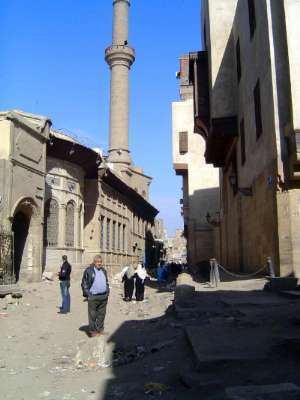 The minaret ahead is part of the Complex of Barquq. (No. 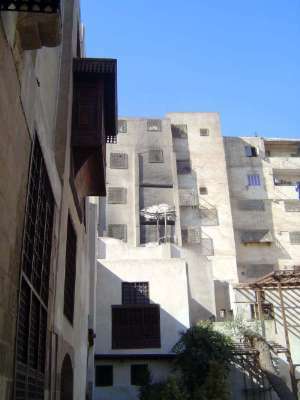 21) Before we get there, here's the Sabil and Kuttab--waterpoint and school--of Abd al-Rahman Katkhuda. It's recent--1744--but important because its innovative design, with cantilevered balustrade and semicircular arches, was subsequently copied frequently. (No. 562) We're approaching the ablaq, or striped, entrance to the Complex of Barquq. 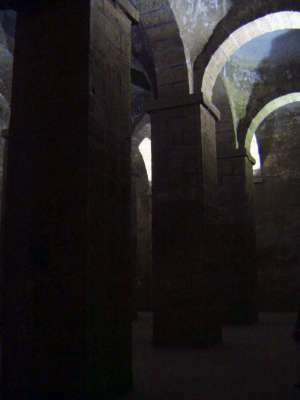 Meanwhile, however, in the foreground is the entrance to the Hammam, or bathhouse, of Inal, built in 1456 and still in use, though the part for women has been demolished. (No. 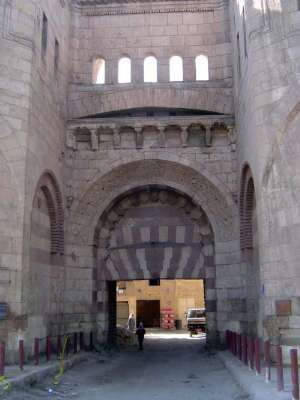 187) The crenelated facade and semi-domed entrance of the Complex of Sultan Barquq, built in 1384-86. 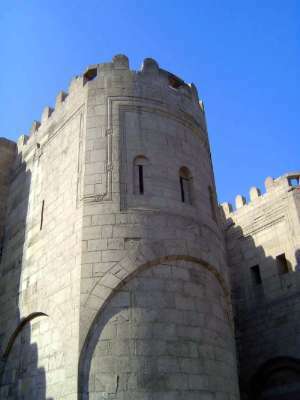 Barquq was the first Burhi Mamluk sultan. (No. 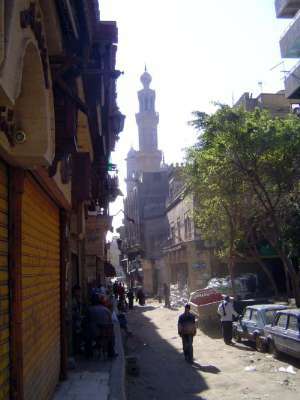 402) A more distant but complete view of the Barquq facade, with its minaret. 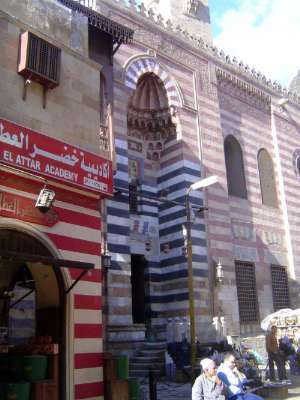 On the right is another waterpoint-school, this one the Sabil-Kuttab of Isma'il Pasha, a son of Muhammad Ali. 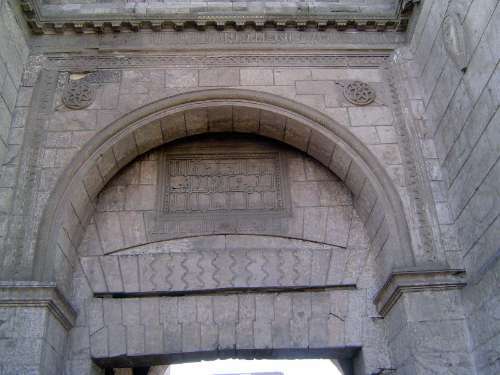 In 1822 Ismail had been murdered in the Sudan, which explains this sabil, built by the father in memory of his son. 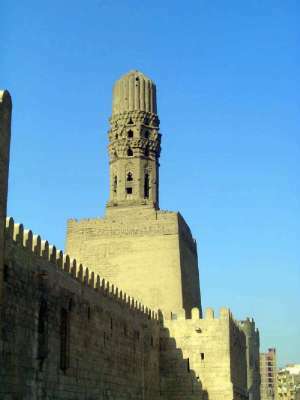 Minaret of the Complex of Barquq. 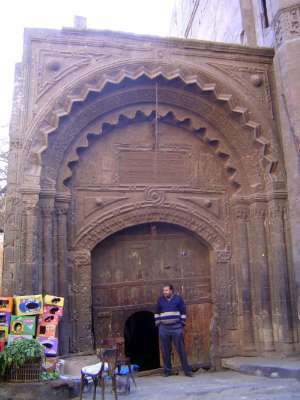 Entrance to the Barquq complex, with a typically bent entrance. 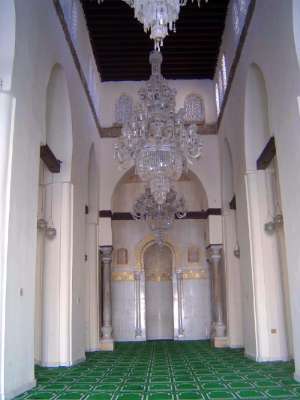 Inside is a small courtyard with this central fountain, surrounded by four iwans or porticos. 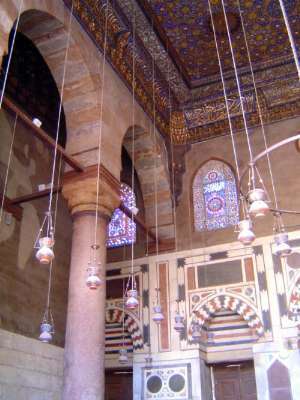 A view of the Mecca-facing iwan, with a marble dikka, a platform for leading prayers by those who cannot see the pulpit, or minbar. 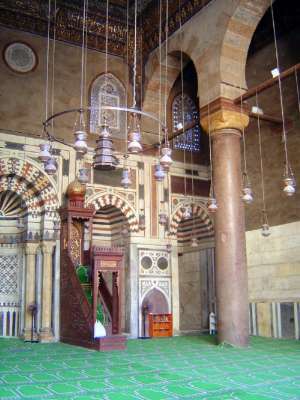 The wooden pulpit, or minbar, is overshadowed by the elaborate ornamentation of the iwan,, which is subdivided by pairs of massive (and presumably much older, recycled) granite columns. A better view of the ceiling. (Nos. 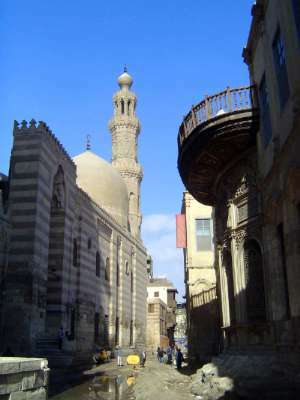 43 and 44) On the left is the minaret of the complex of Qalawun, built in 1284; on the right, with a circular minaret, is the slightly later (1294-1306) minaret of the complex of his prolific son, Sultan an-Nasir Muhammad. 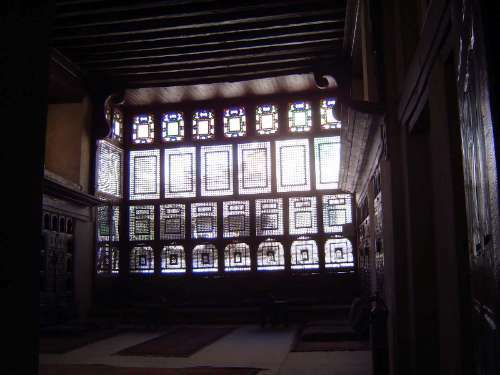 It's the first of the city's cruciform buildings, with separate sections for students of the four Islamic schools of jurisproduce. Unfortunately, both were still closed for renovation in 2007. 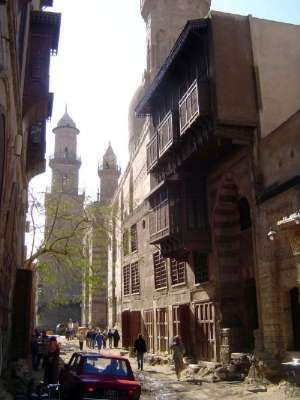 A better view of the Complex of Qalawan, built in a single year by the first Mahri Mamluk sultan and the oldest of this sequence of complexes on this section of the street, here called the Bayn al-Qasrayn.